These flashcards help prepare for exams, checkrides, and interviews! Questions for Parts 119, 121, and 135 operations. 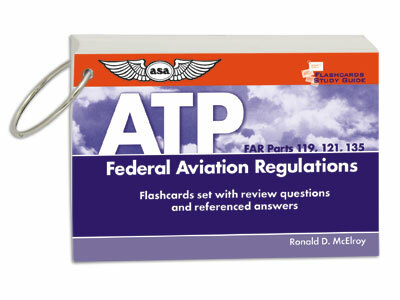 Flashcard Study Guides help to develop and maintain a solid core-knowledge of the rules and regulations that are a part of a pilot's daily life. Designed to be easy to pack and carry, flashcards provide pertinent regulatory questions with detailed answers and references for further study. Written by airline pilot instructor and author, Ron McElroy, the cards are especially helpful for folks preparing for an ATP checkride or airline interview. Printed on heavy card stock in a 4"x 6" format, shrink-wrapped in clear plastic. A hole punched through the cards and a metal ring clip is included to keep the cards in order. The Airline Transport Pilot Computer Testing Supplement is the FAA "test figures book" available separately, and also included with the Airline Transport Pilot Test Prep. Airline Transport Pilot Test Prep book AND Prepware Download (software). All the ATP and Dispatcher FAA Knowledge Exam questions, supported with answers and explanations. Includes CT-8080-7C. Includes FREE 24-month access to Prepware Online. Comprehensive preparation and study aviation software for the Airline Transport Pilot, Dispatcher, and Flight Engineer FAA Knowledge Exams. Includes FREE 24-month access to Prepware Online.